Happy Birthday Cards is a free Windows 8 Greeting Card app that offers a beautiful collection of birthday ecards. You can send these cards to your friends and loved ones right from the app itself. It is a handy app with a very appealing interface. 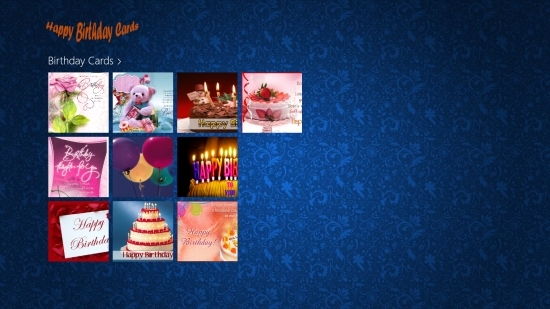 The greeting cards with beautiful birthday messages are displayed as tiles on a designer background. 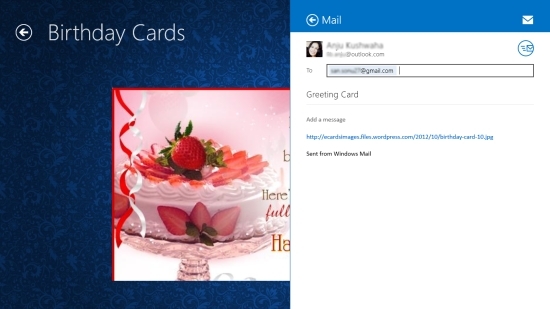 The app is also has a Send option, which lets you send these cards via e-mail, using the Windows 8 Share Charm. 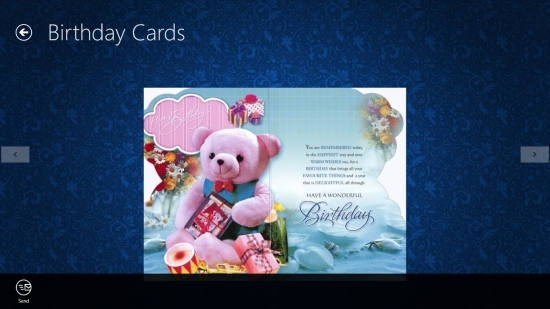 Happy Birthday Cards can be availed freely from the Photo category of Windows Store. You can use the link given at the end to go to the app’s page directly. Let’s have a look at this free Windows 8 Greeting Card app. To send these beautiful birthday cards to your friends and loved ones, install and launch the app on your Windows 8 system. Remember that you need an active internet connection to access contents of the app. The Start screen of the app looks wonderful with pictures of birthday cards arranged as picture tiles on a designer background. Click on Birthday Cards written on top of these tiles to access these cards. The next screen will show you pictures of all cards. Click on a card to open it on the app’s screen. Use left and right headed arrows to navigate through various birthday cards in the app. As you right click on the screen, the app bar will display Send option on left corner. Click on this option to bring the Share charm, which will let you send the desired card via e-mail. Also check Hallmark Go Cards and Postino Postcards. Happy Birthday Cards is a nice free Windows 8 Greeting Card app to send ecards to your friends and family members on their birthday. However, it contains a limited collection of cards. Also, it would have been better if one could add a message to these cards before sending off. You can still give it a try. Get Happy Birthday Cards here!